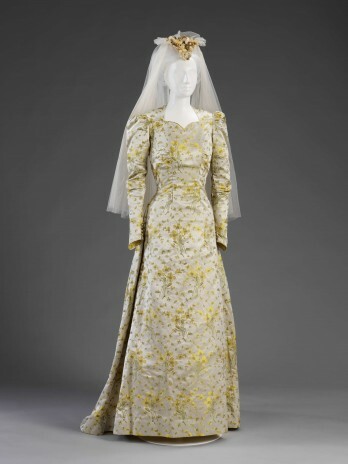 1946 Wedding dress from the exhibition Unveiled. This dress was made by Ella Dolling from a light weight upholstery fabric for Elizabeth King. Elizabeth did not have enough coupons to purchase dress fabric, so opted for a suitable alternative. Collection of Victoria and Albert Museum, Given by Mrs Gay Oliver Barrett. A great Cary Grant film. 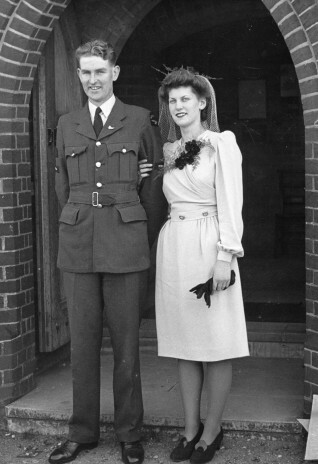 Andrew is referring to the 1949 film ‘I was a Male War Bride’ starring Cary Grant as the ‘war bride’ and Ann Sheridan. You can watch a little clip on YouTube – http://www.youtube.com/watch?v=YJhYrQahf30.